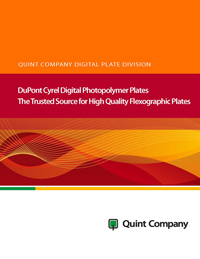 Quint’s new Digital Flexo Suite offers significant cost savings through the automation of the flexo plate production. It is a collection of Esko’s plate making software, designed especially for the needs of the packaging industry– a time savings that we can pass along to our clients. The Digital Flexo Suite adds a flow of information to plate making. Automatically, instantly and with computerized accuracy a job is sent to the imager, files are created for cutting and data files are made for mounting. We’re staying current for YOU!